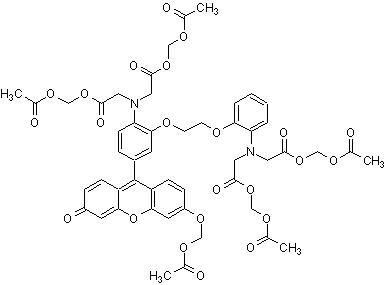 Medium affinity green fluorescent calcium binding dye. Cell-permeable. Medium affinity green fluorescent calcium binding dye. Binds to intracellular calcium (Kd = 390 nM). Fluorescence intensity increases upon Ca2+ binding. Cell-permeable. Fluo-8 (or Fluo-2 Medium Affinity) has been found to be brighter (1.5x) than Fluo-4 in cellular experiments. It offers improved cell loading and Ca2+ response while maintaining the convenient Fluo-3 and Fluo-4 spectral wavelength of maximum excitation at 490 nm and maximum emission at 520 nm. Fluo-8 loading can be performed at room temperature. For more information on AM esters please visit our AM esters FAQ page. Functional Studies - Fluo-8 AM, green fluorescent calcium binding dye (ab142773)Cui et al PLoS One. 2013;8(3):e59921. doi: 10.1371/journal.pone.0059921. Epub 2013 Mar 20. FFA treatments increase Ca2+ influx to induce ERS in β-TC3 cells. β-TC3 cells were incubated with FFA or BSA for 16 h, and then stimulated with 4 µM thapsigargin for 20 min to activate store-operated Ca2+ entry. Fluorescence densities of Ca2+ change were monitored in Fluo-8/AM-loaded β-TC3 cells after FFA or BSA treatments. U2OS cells were seeded overnight at 40,000 cells per 100 µL per well in a 96-well black wall/clear bottom costar plate. The growth medium was removed, and the cells were incubated with 100 µl of 4 µM Fluo-4 AM or Fluo-8® AM in HHBS at 37 °C, 5% CO2 incubator for 1 hour. The cells were washed twice with 200 µl HHBS, then imaged with a fluorescence microscope using FITC channel. Fluo-8 vs Fluo-4 sensitivity to calcium release in HEK-293 cells induced by Carbachol. Publishing research using ab142773? Please let us know so that we can cite the reference in this datasheet. There are currently no Customer reviews or Questions for ab142773.